Once players understand the connection between the tackle they use and the specific part of the field they're on, practice progresses to 1-on-1, 2-on-1 and 3-on-1 drills that better reflect game-like conditions. Coach Jagday explains how tackling is more than simply taking the ball away from the offense. Tackling strategies include tactics, planned footwork, close shadowing of the ball handler, timing, shifting your hands and grip as well as channeling the ball away from the areas of greatest threat. Knowing precisely when to tackle or when to commit is probably more important than knowing how to tackle. This presentation will strengthen the tackling skills of more experienced players and lay a strong foundation for new players. Coach Jagday gives coaches the insight to efficiently correct and improve their players. 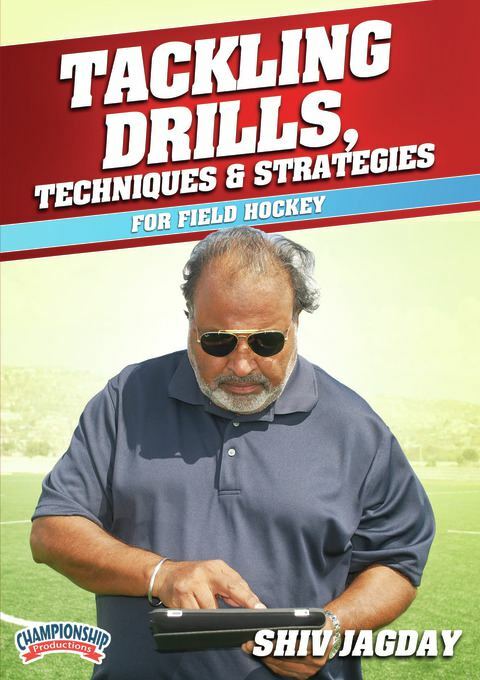 "Shiv Jagday is widely regarded as one of the best hockey skills coaches in the world, with over 40 years of experience at all levels from beginning juniors to Olympians. In his inimitable style of friendly interaction with his pupils, Shiv outlines the basic purpose of the exercise, identifies the fundamental elements involved, explains clearly the techniques required, and demonstrates each component thoroughly before guiding his pupils step-by-step through the drills devised to learn and practise the skills. At each stage, Shiv points out how and why there is a breakdown in its execution, gently encouraging the players to try again and then providing positive reinforcement to the players with accolades for success in mastering the skill.